Do you want to take an amazingly easy as well as an incredibly significant step towards realizing your dream of becoming a doctor? *Internationally accredited **Developed for ALL students interested in a career in medicine ***DVD-ROM and medical training kit included ****Approved supplier of Accredited Distance Learning medical skills resources! Get Dr. Anton Scheeper’s Kit: Learn Every Skill a Future Doctor Needs to Examine a Patient! 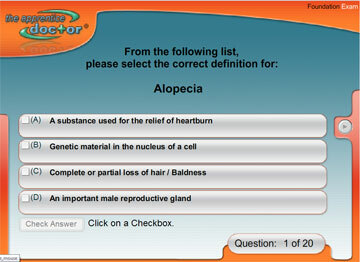 Complete the acclaimed Apprentice Doctor® Foundation Course anywhere by ordering it as a distance learning resource. Join the multiple thousands of students who launched their medical career with The Apprentice Doctor® Foundation Course! Experience all the benefits of attending an Apprentice Doctor® Camp – in the comfort of your home. Get an Apprentice Doctor® Certificate on successful completion of the course – and the opportunity to get formal accreditation. How to Examine Patients® Foundation Course is a medical skills course available on DVD-ROM. It offers a valuable foretaste of clinical medicine with over 50 hands-on fun medical projects to be completed. Maximum time allowed to complete course before booking your assessment: 16 weeks from date of delivery of course material. Recommended for: All students interested in following a career in medicine – especially those in the process of building a respectable résumé for entering medical school e.g. High School and Premed students. Organized premed clubs at school/college/university levels are welcome to enquire. Do you sincerely want to become a doctor? Do you want a “head start” towards pursuing your dream of becoming a great medical professional? Would you like to add a significant extra to your résumé to impress the medical school selection committee? Would you like to add credits to your High School studies (if applicable)? Would you like to gain over 20 medical skills? “Here’s How to Easily Take Your First Exciting Step – Guaranteed to Help You Reach Your Dream of Becoming a Doctor”. If you want to become a doctor – you have to start building your resume EARLY – to get the competitive edge that you will need to get accepted in to Medical School! Complete this accredited premed course in the comfort of your own home! All the medical instruments and items required are included in a neat medical For Future Doctors Kit – plus a lot of complimentary bonuses. The Apprentice Doctor® has been developed by leading practicing medical professionals under the leadership of Dr Anton Scheepers a Maxillofacial and Oral surgeon – all with a passion for medical education. The Apprentice Doctor has been involved in Premedical Training since 2002 and has assisted tens of thousands of aspiring doctors and associated medical professionals in realizing their dreams. Foundation Course and Kit Orders – for Future Doctors. Do not delay – Order now! 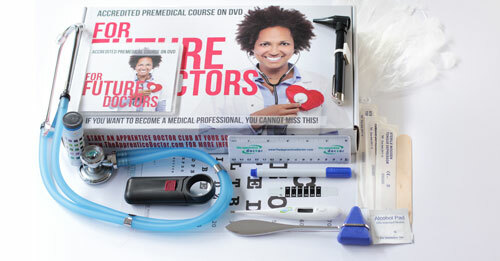 Order your Apprentice Doctor Foundation Course material on DVD-ROM – including the acclaimed For Future Doctors Kit. (See online order link towards the bottom of this page). 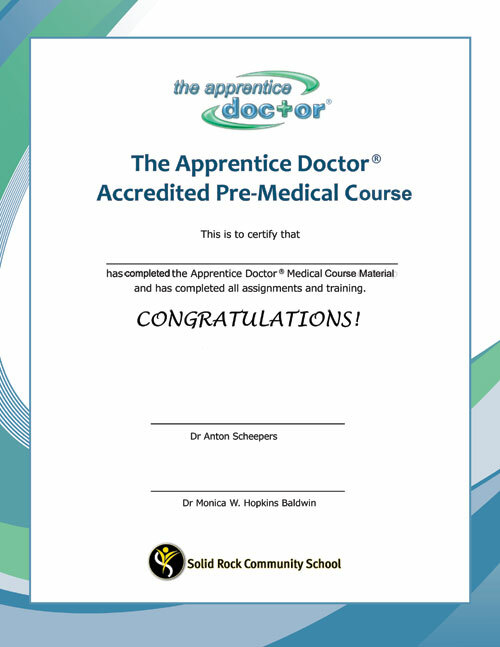 …and receive your Apprentice Doctor® Certificate – to be proudly displayed. Keep your Apprentice Doctor® Foundation Course Certificate and Exam results in your Résumé File and use when applying for acceptance to University or Med-school! Get formal transcripts (from Solid Rock School in Trinity FL ) for completing and passing the Apprentice Doctor® Course Material and earn formal high school credits in pre-medical sciences (or equivalent subject) for your hard work! This service is available for an additional fee. Contact us for more information should you be interested. Click Here for more information regarding accreditation. Great For International Students Too! Work through detailed sections on contemporary health related issues e.g. HIV and AIDS, Heart Murmurs, Obesity, Diabetes Asthma, etc. Get a fully functional finger pulse Oximeter for only $19.95 after successfully completing the Apprentice Doctor® Distance Learning Course. Other accredited pre-med courses will put you back $350 – $450 or even more (and does not include the relevant medical instruments and items for completing the course). Our pre-med course includes email support with advice from qualified Medical Professionals, formal evaluation on completing the course material, as well as The Apprentice Doctor Certificate to successful candidates for the absolutely ridiculous price of only $97. (The normal price is $150 – the offer at $97 is a limited offer which will expire at the end of November 2013!) We cannot promise that we’ll ever be able to give you access to our accredited pre-med course at the same price again. The For Future Doctors Pre-med Course is intended for all High School as well as Premed students with the dream of becoming a doctor, surgeon, or other medical professional, and will add a significant extra to your application to University and later to Medical School. The Apprentice Doctor® ”For Future Doctors” Kit with the following fully functional medical instruments included: A Rappaport Dual Head Stethoscope, An Examination Light – convertible into a simple Otoscope, a Magnifying Examination Light, a Patellar Hammer, Urinary Test Strips, A Digital and a Forehead Thermometer – and Various Disposable Items! 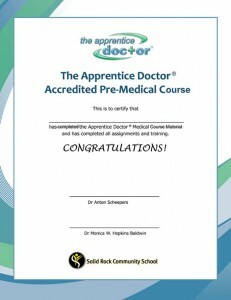 An Apprentice Doctor® Certificate on completion and successfully passing the evaluation module. Optional: Formal transcripts available for completing the course are available for an additional $300. The transcript service is optional – only to students in the USA seeking formal high school credits for the course. A small investment in your future that will make a big difference! Amazingly the best High School Premed Course is also the most affordable course – the course on DVD-ROM as well as all the instruments and items are included at $97! You will be able to download The Apprentice Doctor® Foundation Course EBook after ordering your Course material and Kit. 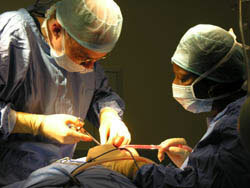 The Apprentice Doctor® Course on DVD-ROM and accompanying Medical Training Kit will usually be shipped within 48 hours. Kindly allow 7 – 10 days for delivery (free shipping only in these 2 countries). Transcript services are not available to students outside of the USA. Shipping costs ($29) will be added to all orders outside of the USA and Canada. 7. WHICH BRANCH OF MEDICINE?